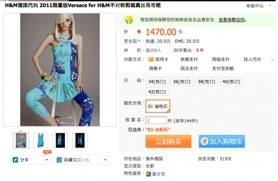 Versace for H&M Doesn’t Go On Sale Until November 19 But Someone Is Selling It Online Already!? Yikes. The Versace for H&M frenzy has just begun, with the runway show and party featuring performances by Prince and Nicki Minaj but I just received a tip that an online Chinese retailer is already selling the full collection. Every piece is available for sale at an online mall called Germany Street (it’s similar to a site like Amazon and sells ‘European styles’ hence the Germany connection) and the price conversions from Yuan to dollars suggest that the collection will be a bit steeper in China. The dress Abbey Lee is wearing below will retail for $149 when it is sold at H&Ms in the US in a week and a half, while the price on Taobao.com is 1470 Yuan (about $231). Allowing that Google Translator is less than reliable (and in this case seems to translate each item of clothing a “baby” and does nothing to clarify the Germany connection), the site seems to promise that the product is genuine. Each item is shot at several angles, including look book images where available. Update: Just spoke with someone who could read the simplified Chinese on the site who confirmed that the site promises the authenticity of the garments. I’ve reached out to H&M and Versace for comment about the legitimacy and legality of the line being sold and will update when I’ve heard back. Previous PostPrevious How To Wear A Vest This Fall ! !